A few weeks ago, I signed on to a letter with some student leaders regarding AFSCME 3299’s decision to sue the UC Regents. The letter used some excessive and needlessly provocative language, and was an over reaction on my part. I regret attaching my name to it. I did so because I thought (and still do) the AFSCME lawsuit was dangerous to the hard fought progress to build adequate housing for students and working class people in Davis. I still stand by that position. I also apologize for the choice of wording. Words matter, and we chose them poorly in this case. In the last few weeks, I have had many conversations with my union sisters and brothers about this issue. I hear their criticism of my actions, I understand it, and in a real way, appreciate it. We have had the opportunity to discuss the rotten effects of the housing crisis on UFCW members, AFSCME members, students and the working class in our community. The student leaders at UC Davis have fought really hard against a local culture that too often sees them as second class citizens, nuisances, cheap labor and cash cows to be exploited at every turn by unscrupulous landlords. They have fought for housing, for a renters rights ordinance, against tuition hikes and for workers. They have experienced a whole lot of undeserved grief from the community they sustain, and too often, their efforts are not recognized. I felt it was important to stand with them in their efforts to improve the housing market for renters. Those who seek to divide the interests of students from the interests of the working class simply do not understand that the fates and interests of these groups align almost perfectly. The student who cant find affordable rental housing is in the same boat as the grocery clerk who cannot find affordable rental housing. I wish to re-state my unwavering support for AFSCME 3299’s mission of improving the lives of their members through aggressive collective action and bargaining, and to the labor movement as a whole. I always have, and always will support them in their strikes, delegations, negotiations, elections and direct actions. I stand with the AFSCME negotiating positions on livable wages, health care, a dignified defined benefit pension, against the UC’s attempts at union busting and attempts to outsource union jobs. Those who would blame janitors, groundskeepers, cooks, and clerks for tuition increases are wrong to do so. The bloat and excesses of the UC system is not caused by people who serve students food or take out the trash, its caused by unaccountable, redundant, gilded six figure salaried administrators, the rising cost of health care, and a lack of commitment by our elected officials to make free higher education a reality for everyone. I encourage all of you reading this to join AFSCME 3299 workers UPTE 9119 workers, students, myself and the community Tuesday October 23, and Thursday October 25 on the picket lines at La Rue and Orchard road. More information can be found at UC Davis On Strike! The following is a statement issued by one of the student leaders I referred to earlier. 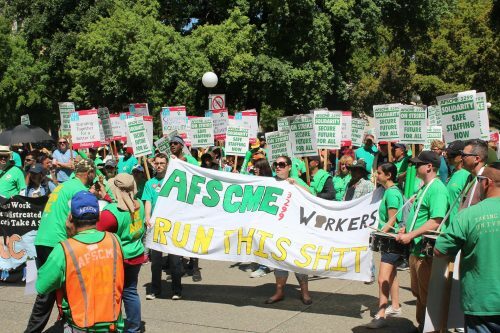 In the wake of the controversy ensued from our statement on the AFSCME lawsuit, I see it prudent to restate my devotion to the cause for which the Union stands, reiterate that I will support the Union in their upcoming strike, and apologize for the fact that in our haste to protect our members, the students, I may have used incendiary language – I apologize if I offended the Union or implied any hostility, that was certainly not my intention. While I continue to advocate for more housing for students, I will oppose the University’s decision to outsource Union jobs. The rights of the workers to fair and respectable wages are as important to us as the right of the students to respectable living conditions, and I regret if my initial statement may have failed to deliver that message. Sean Raycraft is a lifelong Davis resident, and UFCW Local 8 Shop Steward. Sean – I appreciate your article and your honesty. I have some thoughts about the comments of Mr. Masias-Malagon. I want what I am about to say to be seen as positive advice from an individual who is always in support of union efforts to improve the lives of their members. It is also based on the fact that I have had to write a number of retractions/apologies from my more impassioned days. Words do matter. Initial words matter, the wording of retractions matter, and words used in apologies matter. My criticism of the above “apology” should be seen in this light. The use of the word “may” might have softened the impact for the author, but that is not the point. If one has made an error, they should own it outright. If you did it, it is not “may have”. It is “I used incendiary language”. Same for “if I offended”. You already know you did. Just own it. If you feel you were in the right, please stand by your words. If you know you were wrong, please just own it and move on. The decision by AFSCME is going to delay the building of student housing possibly by years. While I am supportive of unions in general, the unions didn’t exactly keep in mind the needs of student renters. Seems to me that Sean has at least a somewhat broader perspective (and understands the relationship between wages and ability to afford housing), better than you do. And, he seems to understand that they’re actually overlapping issues. How can you offend a non-human entity? Maybe instead “if I offended some of the union members”?